The Pigment Compendium Dictionary is a comprehensive information source for scientists, art historians, conservators and forensic specialists. Drawn together from extensive analystical research into the physical and chemical properties of pigments, this essential reference to pigment names and synonyms describes the inter-relationship of different names and terms. The Dictionary covers the field worldwide from pre-history to the present day, from rock art to interior decoration, from ethnography to contemporary art. Drawing on hundreds of hard-to-obtain documentary sources as well as modern scientific data each term is discussed in detail, giving both its context and composition. The authors' note right at the start of this encyclopedic work for art historians, conservators, and forensic specialists cites historic complaints that the names artists have recorded for the pigments they used in their paintings, frescoes, etc., are notoriously unreliable. Hence, the hundreds of cross-references to help researchers get to the pigment an artist used in a work despite what he or she may have called it. The reference also works from the standpoint of wishing to confirm a particular pigment by describing in detail its physical and chemical properties. This incomparable art reference for determining important matters of works of art goes beyond such scientific information to include as well historical notes on many of the pigments. The entry "Burnt Ochre" is an example of most of the thousands of entries: It begins with the general comment that the "phenomena that yellow ochre when heated converts to red ochre" has been known since pre-historic times. This is followed by a note that the fourth-century B. C. philosopher Theophrastus wrote a detailed description of the process of "producing burnt ochres." Then comes the physical and chemical information--"The process in action is the thermal transformation of goethite...to iron(III) oxide, whereby the goethite begins to dehydrate...," and so on for about 20 more lines. (The chemical equations in the quote are omitted in this review.) After this comes a few short paragraphs on comments later writers have made on burnt ochre, with the entry ending with remarks on the term for this pigment and related terms. 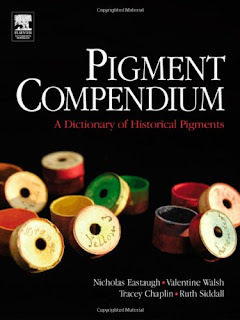 The "Pigment Compendium" is an exhaustive, reliable guide to resolving important matters about works of art using pigments--matters which may involve accurate dating, and in some cases also involve large sums of money for museums or private collectors. Every museum, art library, and serious art collector should have a copy.